The other day, my mom and I took a cruise up Sheridan, from the city, through Evanston all the way up to Highland Park. She was right when she advertised it as a relaxing drive, especially going through Winnetka, Glencoe and all those other lakeside towns. The houses along Sheridan around there are AMAZING. I’m talking mansions of all styles. And it was a trip down memory lane to stop by Glencoe, walk past the tennis courts where we used to play as kids, and overlook the beach we used to visit back in the day. 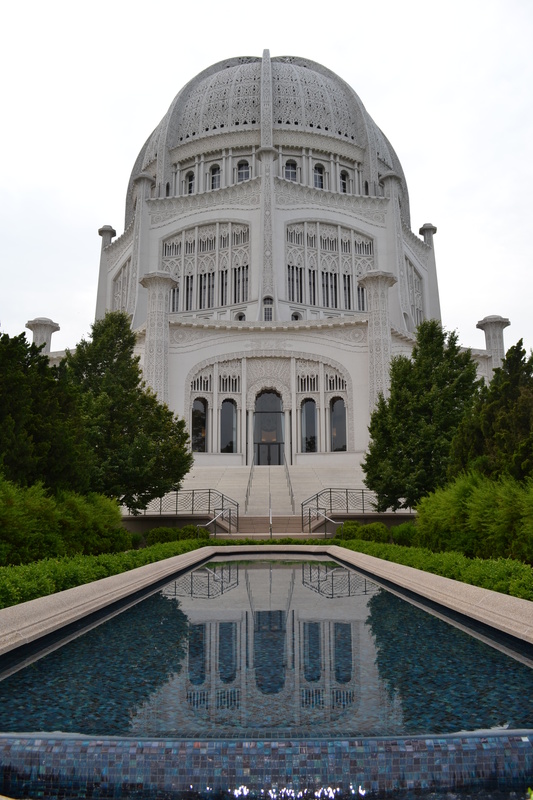 Before we hit the road we stopped at the Baha’i Temple in Evanston. This temple is actually only one of seven in the world, and the only one in the U.S. As a quick primer, the Baha’i faith is a relatively new religion that aims to bring together the world’s religions and unify humanity. As such, it was interesting to see symbols from other religions, like the Christian Cross and Star of David, incorporated into the facade. The Baha’i faith seems like a very independent and free-spirited religion. So the atmosphere surrounding the temple is quite peaceful. There are little fountains and pools of water with vibrant blue tiles adding a burst of color to the pristine white temple. It’s a great spot just outside of the city, a stone’s throw from Lake Michigan, to go and reflect on things.